Simpson Bay, St. Maarten – After 30 years of "Serious Fun" the St. Maarten Heineken Regatta still holds great aspiration towards the future, both short - and long - term. Introduced in last year’s event, the St. Maarten Heineken Regatta again commits to the Sailors for the Sea Clean Regatta program as it strives to achieve Bronze level certification. In cooperation with the Sailors for the Sea, the only ocean conservation nonprofit focused on the sailing and boating community, the Regatta Organization tries to reduce our impact on our oceans and coastal waters. The St. Maarten Heineken Regatta has tried to operate as environmentally friendly as possible. The use of reusable bow numbers, paperless registration, biodegradable products in the office and with the help of sponsors creates environmental awareness to all of those involved with the biggest sailing event in the Caribbean. After being awarded with the Bronze certificate last year, the St. Maarten Heineken Regatta will do its best to improve on last year. With the help of three 100% dedicated sponsors the aim is to maintain the environmental awareness on our island. Title sponsor Heineken has ordered biodegradable cups that will be used at the parties during the event. Furthermore they decided not to issue straws which will help reduce a significant amount of waste. And with the success of last year, the bracelets will be sold in order to raise money to protect the natural environment of both the French and Dutch marine parks on the island. Sol, the official supplier of motorized support during the St. Maarten Heineken Regatta, will provide all the boats with marine absorbing pads that will prevent our waters from oil spill. Sol has proven through the years to be very aware of the impact that this event has to their island, and they have taken responsibility to maintain the beauty that our Friendly Island still represents. The new title sponsor of the Commodores Cup (Thursday March 4th) and worldwide leader in marine technical clothing Gill produce their Race Tech Collection shirts that are fully made from 100% recycled plastic bottles. These shirts offer 50 plus UPF sun protection as well as excellent wicking attributes. Made with a dual purpose use in mind. Ideal for base layer use under gear or as a standalone tech t shirt. The fact that these styles are made from recycled materials is a win for the customer and the environment. The Regatta Office itself is as well very aware of their responsibility to set an example. 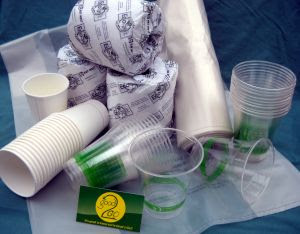 In cooperation with the company Good 2 Go the organization will use several biodegradable products, such as cups, coffee cups, household towels, toilet tissues and garbage bags. In order to reduce the paper usage, the St. Maarten Heineken Regatta aims towards a paperless registration for their participants and all the attending press will be issued with a press package with all the press releases on CD-ROM rather than the paper versions. At registration all the skippers without sail numbers will place a deposit and receive a reusable bow number for their boats, and the regatta organization requests that these bow numbers be returned for use in future years. Finally the Regatta Organization will thank their volunteers for their help by handing out an aluminum reusable Thermal Mug to them! The Organization feels that everyone involved is ready to celebrate 30 years of “Serious Fun” will all the participants. The largest sailing event in the Caribbean will take place on March 4 to 7! Founded in 2004, Sailors for the Sea is a nonprofit organization that educates and empowers the boating community to protect and restore our oceans and coastal waters. For more information on or to participate in any of the Sailors for the Sea programs, or to become a member and support the organization, visit http://www.sailorsforthesea.org/. A full list of Clean Regatta certification requirements is also available online.